THE CIRCLE : Is essential to what we do, both in metaphor, spirit and intention. The circle holds space, it creates community. It is how we connect and connection is where spirit comes from. Without circle, we have no "Dome", we have no Burning Man, we have no Earth. Without circle we actually have no Self. We do individual, paired, or group journeys, healing sessions, etc. but we open and close in a circle. It surrounds us, it protects us and forming one is setting shamanic space and intention, it is almost the act of checking in with spirit itself. POWER ANIMAL : You already have one, and it has been with you since you were born. Let's go find it and put it to work protecting you and guiding you on journeys to non-ordinary reality. SOUL RETRIEVAL : A healing journey to find your lost soul parts and bring them back to you. Soul parts can wander off during and just before a trauma, abuse, car accident, surgery, or bad break-up. Co-dependency typically displaces soul parts. We can bring them back to you, then you will later be responsible for deciding how to incorporate them back into your life. 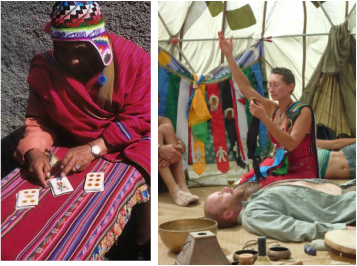 EXTRACTION HEALING : The Shamanista journeys to the drumbeat in order meet with their power animal and spirit guides. Following a brief diagnostic journey, the Shamanista can then remove bad vibes, nasty hitchhikers, stuck up energy, anger or frustrations. We all need a clean out!